Princess Cruises has partnered with Bombay Sapphire Distillery to create a bespoke gin-based cocktail, inspired by the 2,670-guest ship Sapphire Princess and her Mediterranean ports of call. Influenced by the dazzling blue hues of the Mediterranean Sea, the ‘Sapphire Princess’ is the newest addition to the vessel’s cocktail menu. The cocktail launch marks the ship’s return to the UK after sailing around Asia and the Indian Ocean. The drink includes a generous measure of Bombay Sapphire gin, Blue Curacao to evoke the sea and a splash of Prosecco to signify the fizz and bubbles created by waves in the water. If this sounds like the cocktail for you, then you’d better hurry as ‘Sapphire Princess’ will only be available on sailings departing from Southampton between April and October 2019. Certainly, if figures released by Princess Cruises today are anything to go by, it will be a huge success. As in the last twelve months guests onboard Princess Cruises ships have consumed approximately 1.6 million gin and tonics based on a 35ml serving – the equivalent to 28 hot tubs filled with gin. Tony Roberts, Princess Cruises’ vice president UK and Europe, said: “We’re excited to offer this brand-new cocktail which is bursting with flavours. 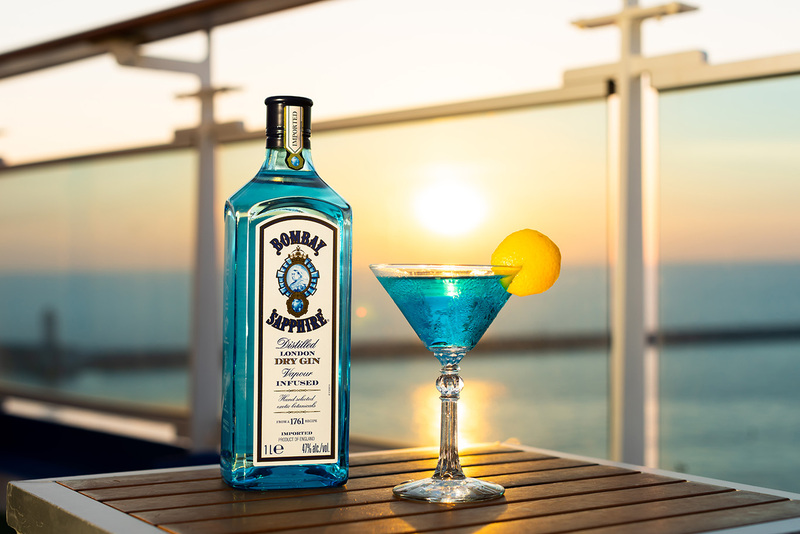 Sam Carter, senior brand ambassador for Bombay Sapphire Distillery, said: “The Sapphire Princess cocktail is a silky smooth, well-balanced libation that takes its inspiration partially from the deep bright blue colour of the Mediterranean Sea and also the countries that the Sapphire Princess sails around. Method: Squeeze the lemon juice into a cocktail shaker and add all other ingredients (except the Prosecco) including lots of cubed ice and shake well for 10 seconds. Using a fine tea strainer, strain the cocktail into a martini cocktail glass and add a splash of Prosecco. Garnish by squeezing and orange peel disc over the drink, allowing the oils from the orange skin to rest on the top of the drink. Then using a knife, make a cut 1/3rd of the way through the orange peel disc and then place on the rim edge of the glass.